This, the third in my series of 'different' films, is a funny little French-Russian co-production that requires a complete suspension of disbelief in the resolution of the basic plot. If you are willing to do that, then the film becomes a very enjoyable experience. To me, it is French farce married to political satire. But even if you do not want to look at the political undercurrents, and can see it just as another uplifting, victory-of-the underdog film, it is still as enjoyable, its gentle (but satirical) humour making for a very pleasant two hours. The world-famous Bolshoi Theatre Orchestra is rehearsing, and a man is standing in the aisle, eyes half-closed, lost in the music, conducting them from afar. 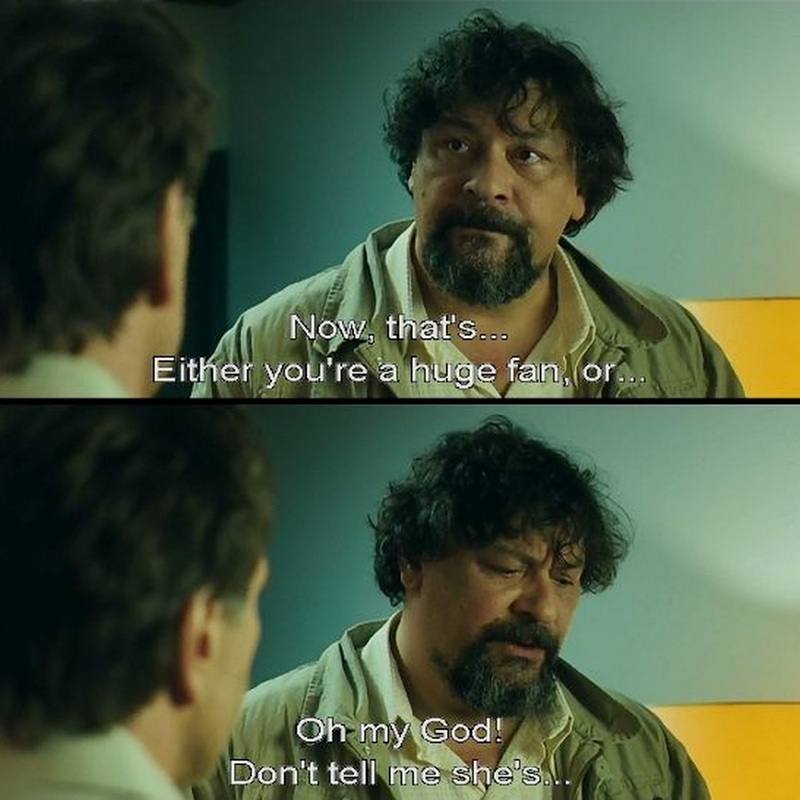 Suddenly, the music is interrupted by the shrill notes of a cellphone ringing, and Andre Simonovich Filipov (Aleksei Guskov), the janitor, is pulled up by the manager for shirking his real job and sneaking off to hear the music - the manager's office has yet to be cleaned. In another day and age, Andre Simonovich Filipov had been 'The Maestro' - the world-famous conductor of the Bolshoi Theatre Orchestra. Today, a broken man and an alcoholic, he works as a janitor in the very theatre where he had once conducted the orchestra to popular acclaim. As he quietly goes about his job, a fax comes in from the prestigious Théâtre du Châtelet in Paris. It is an official invitation to the Bolshoi Theatre Orchestra to perform in Paris. The officials at the Théâtre du Châtelet are in a fix. The Los Angeles Philharmonic Orchestra that was scheduled to perform at their theatre had cancelled at the last minute. If they are not to go deeper into the red, they need a replacement, and need it fast. For Filipov, who is at the end of his tether, this comes as a godsend. For thirty years, he had dreamed of redeeming himself as a conductor. Intercepting the invitation (and deleting the original email), he goes to meet his old friend and the cellist on the now-disbanded orchestra - Aleksandr 'Sasha' Abramovich Grossman (Dmitriy Nazarov), and suggests an almost-impossible plan. If that wasn't bad enough, Sasha is even less prepared for Filipov's next suggestion - they need a manager to deal with the French, and Filipov's chosen man is Ivan Gavrilov (Valeriy Baranov). The man who broke the Maestro's baton thirty years ago and disbanded the orchestra? Filipov knows what he is doing, though. Gavrilov was a good manager, is now a petty politician, and besides, he knows French! Sasha still hasn't forgiven Gavrilov for what he did thirty years ago, and it takes all of Filipov's diplomatic skills to get Gavrilov to agree. What neither Filipov nor Sasha know is that Gavrilov has his own agenda for agreeing to go to Paris. Soon, Gavrilov is on the phone to his French counterpart, Olivier Morne Duplessis (François Berléand) the manager of the Théâtre du Châtelet, who, at first pleased to hear of the Bolshoi Theatre Orchestra's acceptance, is soon aghast at their conditions - the biggest being that the solo violinist be Anne-Marie Jacquet (Mélanie Laurent). However, his accountant soon persuades him to agree - the total expense of paying for the Bolshoi Theatre Orchestra and meeting all their conditions is still less expensive than what they would have paid the Los Angeles Philharmonic. Now Filipov and Sasha need to round up their old comrades-in-arms - 55 of the musicians who had formed the 80-plus original orchestra. They find them - working as taxi-drivers, movers, and otherwise down on their luck. Back in Paris, Guylène de La Rivière (Miou Miou), who is both Anne-Marie's agent and her foster mother, refuses Duplessis' request, but when she hears about the offer, Anne-Marie insists on performing - it's been her lifelong dream to play for Andre Filipov, whose fame had not diminished outside his home country. It doesn't matter that she has never played Tchaikovsky before, she will play for Filipov! Guylène is to call Duplessis at once! Back in Russia, the 'orchestra' is finding new trials - they need visas; most of them do not even have passports. Much to their consternation, they also learn from Gavrilov that their flight tickets will only be paid for after they reach Paris. Filipov's wife Irina (Anna Kamenkova) steps in; she informs Gavrilov that he is responsible for her husband turning into an alcoholic. If he doesn't ensure that Filipov has this chance to regain his past glory, she will see to it that Gavrilov never has any crowds at his political rallies. Ever. And so, the orchestra is forced to accept the 'services' of Pyotr Tretyakin, a mafia boss, who has delusions of being a cellist (He is 'the richest cellist in Russia'. ), in return for his sponsorship. Finally, it is Vassily, the gypsy fiddler, who organises false passports and visas for the entire troupe, and one fine day, the 'Bolshoi Theatre Orchestra' is in Paris complete with false credentials. The French are quite surprised. Whatever they thought of Russian musicians, this was definitely not what they expected of the Bolshoi Theatre Orchestra! Once in Paris, the musicians disperse - to party, to earn money doing odd-jobs, and in Gavrilov's case, to meet his counterpart in the French Communist Party, so he can inspire them to recover the past glory of communism. While the rest of the troupe are out, Filipov has an unexpected visitor. Vignettes from the past flash through his mind. When Sasha comes into his hotel room, Filipov is not quick enough to stop him from opening a shoebox. It is Sasha's turn to be surprised - the box is filled with a collection of Anne-Marie's cds, reviews of her performances. Anne-Marie comes to rehearse, eager to meet the conductor whom she has long admired. She is taken aback when she sees the 'orchestra'. She is beginning to re-think her decision to play with them, especially when she hears Pyotr on the cello, but Sasha steps in to save the moment. The relief is shortlived. Vassily's troop of merry gypsies troop in not only with the intruments for the orchestra, but also ironing boards and formal clothes and shoes in a basket. Vassily, watching Anne-Marie's disdain when she sees the violin in his hands, plays a merry jig and then switches with amazing fluidity to arpeggios. Anne-Marie is impressed, but the rehearsal is not a success. As she leaves, however, Anne-Marie tells Filipov that dinner is still on. When they meet for dinner, Anne-Marie talks about Filipov's past, about how it was so heroic of him to have given up his career to defend his musicians. He demurs. He was not heroic. She talks about her parents and her adoptive mother, and how her parents died. She asks Filipov why he chose her to play the solos when she had never played Tchaikovsky before. Instead of answering her question, he tells her a story. Of his obsession with Tchaikovsky. Of how, through this music, he may find Lea again. Lea Strum. Of how he was conducting Tchaikovsky's Violin Concerto during the years of Brezhnev's reign, and how Jewish musicians had been asked to leave. How he paid no heed, and how Lea and he had planned to play Tchaikovsky together. Lea was a Jew, as was her husband. When Brezhnev sent the KGB to disrupt the concert, Gavrilov had broken his baton, and disbanded the orchestra. Lea and her husband had spoken against Brezhnev to Radio Free Europa and been sent to Siberia for 'treason'. How they died there. How he had never forgiven himself. How he had dreamed, since then, of completing the violin concerto. Anne-Marie is sorry but she is not a ghost. Filipov doesn't want her. He wants her to replace Lea. She knows this is a sort of catharsis for him but she has made up her mind. She cannot play the next day, not when she has never played Tchaikovsky before, not with musicians who have never rehearsed together. 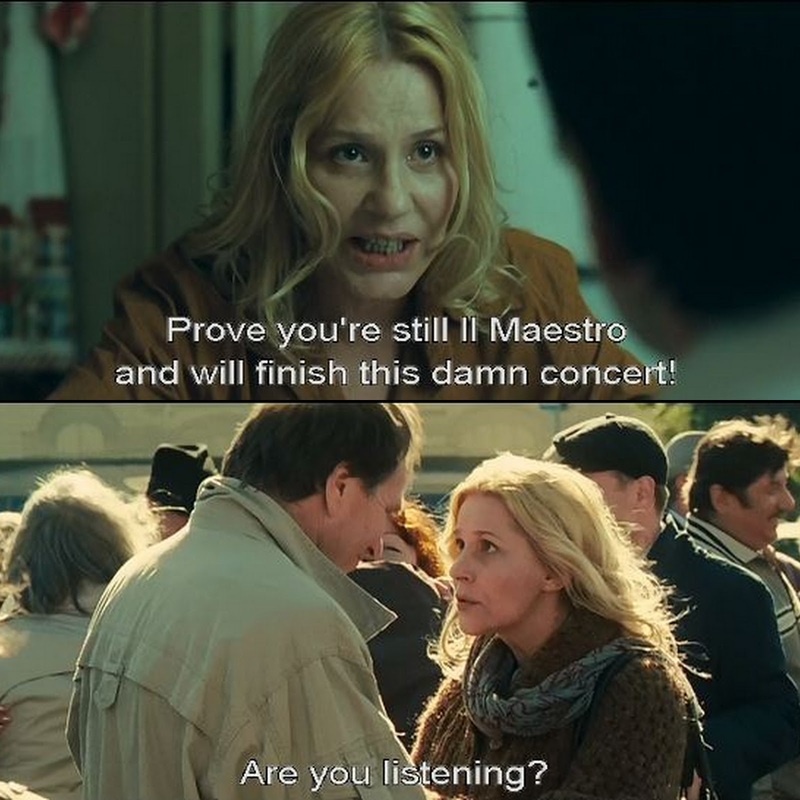 She goes back home and tells Guylène to cancel the concert. However, she has an unexpected visitor the next morning - Sasha, who has come to tell her that she should play, because, perhaps, at the end of the concert, she may find her parents? Anne-Marie is taken aback. Following Sasha doesn't get her any further but the musicians who are with him look at her like they have seen a ghost. When she returns, Guylène is gone, leaving behind a note of apology and a book of annotated violin solos that belonged to Lea Strum. Who is Anne-Marie? And what is Filipov's relationship with her? Why does he have the cds of all her concerts? What is Guylène hiding from Anne-Marie? Who is Lea Strum and what role does she play in all this? Will Andre Simonovich Filipov ever realise his dream of conducting Tchaikovsky's Concerto for Violin and Orchestra again? Beginning as all farces do, with a lie, the film builds on an almost impossible premise - that a motley group of once-famous musicians now down on their luck can impersonate a famous orchestra. It then builds upon that premise - that they can not only get away with it, but also play in such exquisite harmony - without rehearsals. That an up-and-coming star would agree to play for a conductor whose glory days were over three decades before. That she would play Tchaikovsky's violin solos with such virtuosity when she had never played him before. However, by the time the film ends, after almost 15 minutes of magnificent music from Tchaikovsky's Violin Concerto in D Major, one is not only willing to believe that it can happen, one is wanting to believe that it can happen. There is a magic that is evident - in the faces of the musicians, in the way they play their instruments, in the music as it swells and falls around you, at the sheer beauty of the scene that it makes you want to believe in miracles. There is emotion, there is passion, there is harmony, there is truth. You forget the implausibility of the scenario; you just lose yourself in the reality that is in front of you. (After all, it is enough to make Gavrilov, a communist to end all communists, talk to God.) What makes that happen is the music. To conceive a film around the concept of classical music, to use classical music (Mozart, Mahler, Mendelssohn) to effect in various scenes, to set the climax to Tchaikovsky's Violin Concerto in D Major, long considered one of the most difficult compositions for the violin, and to do it all without once letting the momentum of the film flag is probably the film's biggest strength. Two really fine performances drive this tale - Aleksei Guskov, who plays Andre Filipov, the disgraced conductor who is chasing a dream and seeking to lay the ghosts of his past. And Mélanie Laurent, who, as Anne-Marie Jacquet shone, especially in the climax. Because it is her scene, just as much as it is Andre's. Complementing them are a host of minor characters, the best among them being Anna Kamenkova as the sharp-tongued Irina Filipova who is nevertheless supportive of her husband's dream and has never lost faith in his abilities, and Dmitriy Nazarov as Sasha, a man who still has faith in his friend, and is willing to do anything to help him achieve his dream. Underlying the music and the humour (and yes, even the racial stereotypes) is an accurate description of life in post-communist, post-Perestroika Europe. The present is still tinged by the tragedy of the past, and Le Concert is the story of one man's obsession and his attempt to redeem himself. It is a mirror to the atmosphere of an era, one that many people have experienced. There are many sly references to contemporary events, from people paid to attend political rallies, to the flagging enthusiasm towards communism in France, to Russian oligarchs buying football clubs in Europe. The climax itself was a joy, cutting as it does between the past and present and even the future, a montage of scenes offering closure to a story that has remained untold for thirty years. The ghosts of the past have finally been laid to rest. Trivia: Vassily, played by Anghel Gheorghe dit 'Caliu Din Clejani' is a violinist in his own right, part of the Taraful Haiducilor, a taraf or group of traditional musicians from Romania. 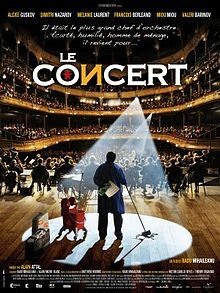 Mélanie Laurent spent two months learning to play the violin at the Orchestre National de France to prepare for her role. She also learnt the bow movements for the concert scene so that her bow would remain on the correct string and she could move it convincingly. I love French films, they make the impossible appear possible! this appears to be a mystery thriller and a feel-good film rolled in one! Maybe this comes on TV here sometime! This is bi-lingual, French and Russian together. It is not a mystery thriller. :) But yes, keep your eyes out for this one, either on TV or the local library, perhaps? The films dealing with the study of human emotions, either as a primary subject or in the background of a set of events call for very strong script, director's own clarity of the message intended to be delivered, strong and clear characterization and, obviously, more than the usual performance by the protagonists. If we go by the proximity of the historical perspective 'post-communist, post-Perestroika Europe', one would recall "War and Peace"(End-of Tsarism and beginning-of-communism) or Dr. Zivago(communism at its full play) as films of the same tableau. How each one has been treated so differently! Will look out for it. Thanks, Anu. And this one is treated differently from both the films you mentioned, Ashokji. I agree with you that a film such as this calls for a strong and clear characterisation. What I liked about The Concert is that the political and social messages are very subtle. It is the human emotions that take centrestage. Yet the message is there, for all that. :) Sorry, Madhu. Don't hate me! I'll see how else one can manage. Perhaps the DVD is available here. Oh. That stinks. I'm sorry. :( The DVD is available on Amazon, I know, but that means having to buy it. Perhaps you will find it there? It is French and Russian, after all. It's the English subtitles that might be a problem. Lots of European films get subtitled in French or/and German, and are available. But I'll find out, or buy from Amazon. Thanks. What's in a name? :) Do watch, and let me know how you liked it. I haven't watched Inglorious Basterds, but I heard she was much better in this. Or so say people who have watched both. She has more to do in this, for one. Thanks for the recommendation; I'll add it to my 'to-watch' list.